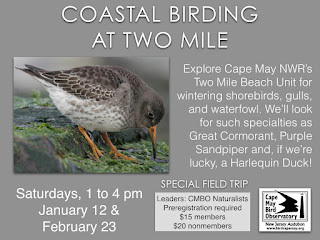 Join CMBO Naturalists on this exciting Special Field Trip. 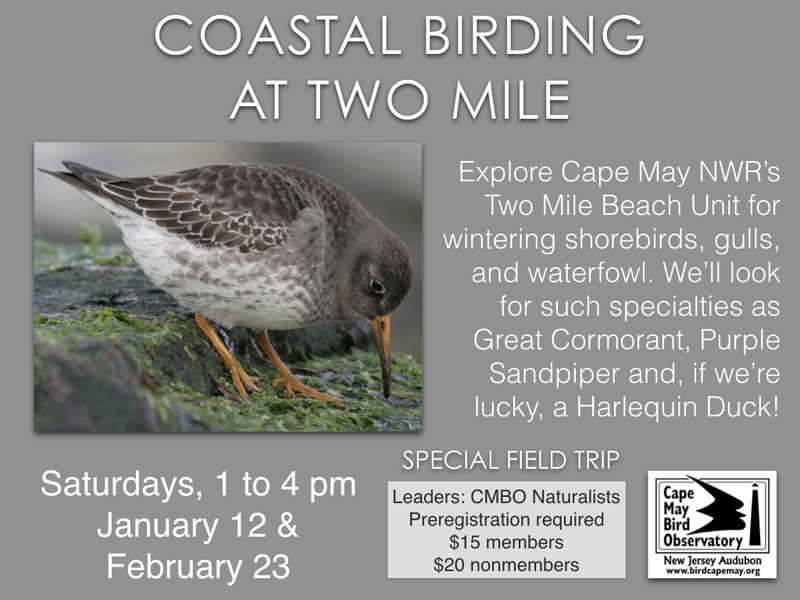 Come explore the Cape May National Wildlife Refuge’s Two Mile Beach Unit’s barrier island habitat, where we’ll see shorebirds, gulls, and waterfowl, as well as offshore migrants such as Northern Gannett and scoters. We’ll walk the beach to the Cold Spring Jetty and look for Great Cormorant and Purple Sandpiper. We’ll also visit the duck blind to view the salt ponds for ducks and raptors. Preregistration required - $15 members, $20 nonmembers. Sharpen your field skills in the workshop that every birder wishes they'd taken. Binoculars show you the bird. Field guides identify the bird. But how many times have you studied a bird, only to discover that all of the information you gathered has evaporated by the time you get to the field guide, or that the one field mark you need to distinguish one from another was the one thing you failed to note? This workshop will teach you how to look, record and recall and, most importantly, how to bird like an expert. 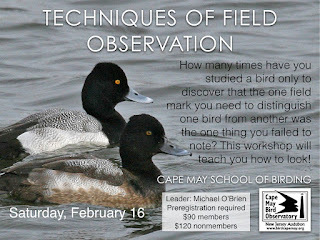 World renowned author, artist, and tour leader Michael O'Brien will show you how to be a better birder on this one-of-a-kind Cape May School of Birding Workshop - you don't want to miss it!!! Preregistration required.